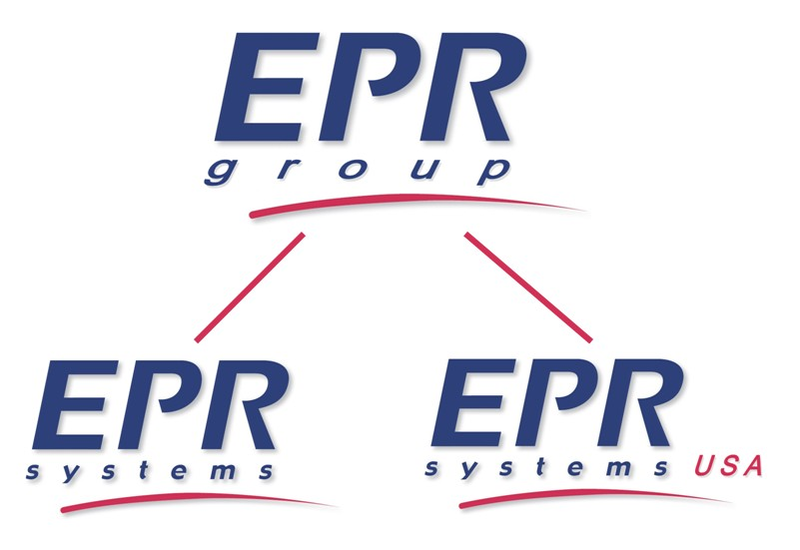 EPR Group began its activities in 2000, when EPR Systems Ltd. was established as a software company that specializes in the development and integration of systems designed specifically for local authorities. 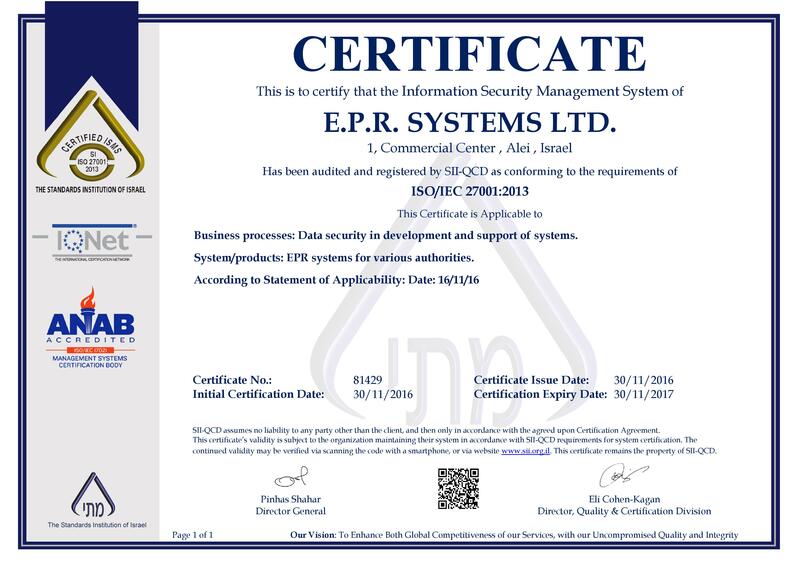 Today, EPR Group includes EPR Systems USA Inc., which provides records management and BI (Business Intelligence) solutions to U.S. clients, e.g. fire departments and EMS (Emergency Medical Services). EPR Group is committed to providing smart and cutting-edge technology and maintaining an outstanding staff with a strong service orientation that is customer centric. This corporate philosophy has made EPR Group the leader in its field. Microsoft development environment based on SQL Server database - This development environment is flexible, guarantees a user-friendly interface and makes it possible to tailor the products to the unique needs of each customer. Available for use with the new cloud computing infrastructure - This work environment enables remote work from any location with an Internet connection and guarantees ongoing maintenance of the database, complete online backups and information security according to international standards. Dozens of specially trained professional employees, including in its online support center, offer a supportive approach and are highly dedicated to satisfying clients' needs. Some of them have even previously worked at local authorities (e.g. as finance managers or bookkeepers). These ensure that EPR Group's team has in-depth understanding of the customer’s needs. Adding this to a highly service orientated organization, it is therefore no surprise that EPR Group offers its customers solutions that fit them perfectly. 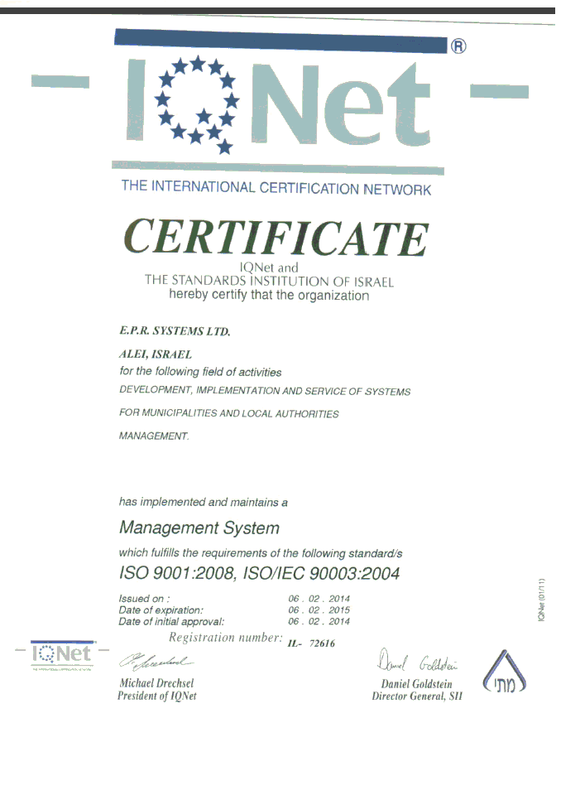 EPR’s municipal management products meet the strict international quality standard ISO9001 and information system management standard ISO27001.